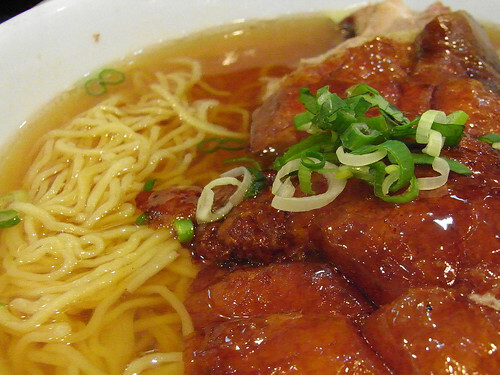 It doesn't really matter whether this place is called Fu Kee or M&B because we have a new roast duck soup spot! Thanks to the trustworthy taste buds of Iridesco, we tried for the first time this generic looking Chinese Chinatown restaurant on Lafayette. A clean broth filled the generous bowl of slightly fatty, but not overwhelming so, roast duck over egg noodles. An extensive list of meat-over-rice dishes means we will be back to try more. Judging by the beef with egg sauce over rice we had today, this could be our new go-to spot for cheap Chinese lunches. Your photo compelled me to go, like a zombie, to this restaurant and eat this dish. My colleagues nicknamed this place "Too Far". When they lived at 275 Canal between Lafayette and Broadway they were often told that 275 was too far for delivery. We always enjoy the hanging food near the front door. FN: Yes! It's one of our unstated goals, to coerce people into eating what we eat. hehe. MV: THAT IS HILARIOUS. We might have to start calling it Too Far for no particular reason of our own except that it's funny.